Archaeologists have always been concerned with where objects are found. For the archaeologist, it makes a huge difference whether something is found in an ancient kitchen, in the inner sanctum of a temple or in the burial niche of a warrior’s tomb. It is these spatial insights that really tell the archaeologist how and in what way certain artifacts were used, and by whom. GIS (Geographic Information Systems) technology is quickly changing the way archaeologists record where excavated artifacts are found on their digs. These spatial databases combine information collected from maps, GPS (Global Positioning Systems), site plans, photos and notes into a single geographic search engine that can easily retrieve anything that has been recorded about a particular artifact or feature from a site. But GIS has also proven extremely useful in the field of archaeological survey, where scholars record and analyze ancient remains that are still visible on the surface. Whether a survey is collecting pottery sherds strewn across a field or mapping an entire Bronze Age mound, GIS allows archaeologists to combine everything they know about a survey area—site locations, topography, water sources, ancient roads and annual rainfall—into a single searchable database. From this GIS database, an archaeologist can then look for patterns in how certain types of sites are positioned in the landscape. Some village sites, for example, may cluster around rivers or roads to take advantage of trade networks, while other types of sites, such as forts, may consistently be positioned on hilltops for defensive purposes. Identifying such patterns of human behavior is one of the primary goals of archaeology. In addition to identifying critical archaeological relationships, however, GIS is opening up new ways for survey archaeologists to view sites and their surrounding environments. With the information obtained from GPS readings, topographic maps and high-resolution satellite images, archaeologists can use GIS software to create lifelike 3-D renderings of entire sites. These 3-D virtual models, such as this GIS-created rendering of Tall Jalul in central Jordan, certainly look cool (some even allow you to “fly over” the site on your computer screen), but they also furnish archaeologists with a great deal of valuable information that might otherwise go unnoticed. Such models, for example, can help locate palaces and temples that haven’t yet been excavated, or they can help determine how much of the surrounding terrain was visible from the city’s walls in antiquity. When applied to ancient landscapes, 3-D models (also called Digital Elevation Models, or DEMs) can tell the archaeologist where ancient roads may have existed, or whether an ancient cataclysmic flood could have destroyed a site or region. Beyond the level of archaeological analysis, knowing the precise location of an archaeological site is becoming increasingly relevant in the rapidly developing world of the Middle East. 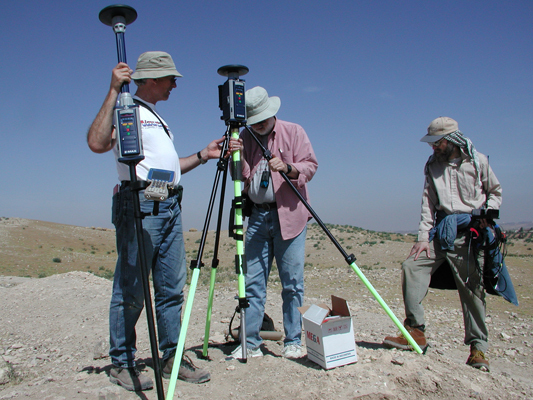 From the Israel Antiquities Authority to the Iraqi Antiquities Department, governments are using GPS and GIS technologies to map and record every single site that is recorded through survey or excavation. With this information, authorities can then make decisions about where a new road should be placed without disturbing ancient remains, or how many sites might be threatened by constructing a new dam. Likewise, as the market for illicit antiquities increases globally, GIS is becoming a valuable tool for monitoring sites that are threatened by looting and destruction.